that I could post some sneak peeks for you all to see of MFT releases. There are 3 new stamp sets on January 9th for you all to see: Be Mine (mini set), Punny Farm, and Happy Occassions. My mouth dropped when I received these sets and I couldn’t stop thinking of ideas for these really cool sets. Isn’t this so cute? I love this card. I found myself wanting to create a lot of things with this cow image. And with a sentiment that states, “Herd It’s Your Birthday”. That meant I got to stamp more than one on a card:) I even restamped the heads, colored, cut out, and attached with Stampin’ Dimensionals to give it a more realistic appearance. Did I mention I love these cows!!! My Favorite Things will be hosting a New Release Cocktail Party on Wednesday night (January 9th) from 9-11 pm EASTERN time. There will be sneak peeks, lots of fun and a chance to become MFT’s next Guest Designer. Head over to the MFT forum on SCS for more details! 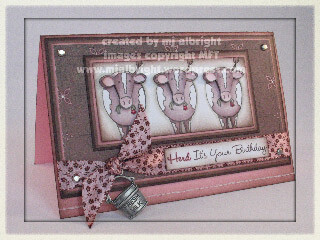 CARDSTOCK USED: Pretty in Pink, Chocolate Chip, Close to Cocoa, Papertrey White, BasicGrey Blush – Girlfriend. INKS USED: Brilliance Graphite, Chocolate Chip, Pretty in Pink, Rose Red, uni-ball Signo White gel pen. ACCESSORIES USED: Silver Brads, Martha Stewart Ribbon, Karen Foster Farm Mini Charms, Crafters’ Tool Kit (paper-piercing tool for faux-stitching), Stampin’ Sponges, Stampin’ Dimensionals, Aqua-Painter. This is too cute! Love the little charm! Darling card! 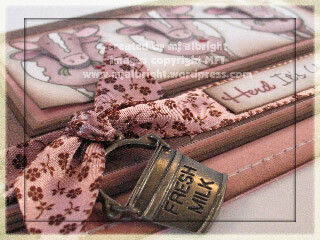 I love the charm and that ribbon is fantastic!! What a fantastic card! The charm finishes is off perfectly. That milk bucket is udderly perfect! heehee! And Im in love with that ribbon, btw! Wow! What a perfect card! The charm is fabulous! awesome as usual! That set looks like it might be fun!!! Oh my good golly – I’m loving this card and I’m needing this set! Your card is awesome! I love the milk bucket charm! Too cute! So cute! Perfect charm too! Looks like a FUN set to get! How perfect is that charm! The entire card is BRILLIANT! That card is absolutely precious. I have to have that set so I can CASE your card for my brother’s birthday. He is a dairy farmer in PA. You have so much talent. Thanks for sharing. Perfect! The coloring, the colors you picked, all the details…..everything perfect. Wonderful card! Too cute! Okay, I want them all!! Love the cows with the dimensional heads. . .very neat effect!